I FFO'd another thing. I'm very pleased with how it turned out. This is Lizzie Kate "A Little Gray Hare." It's a kit that came with linen, threads, beads, backing fabric, and ricrac. 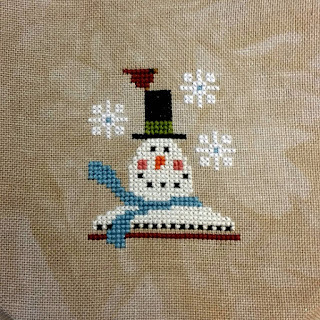 I stitched it last March, woops! 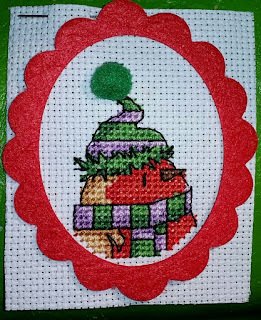 I was afraid of messing it up in the process of cutting/assembling it as an ornament, so it languished in my drawer of stitched-but-not-FFOd things til this past weekend. No ideas yet on how to finish it. 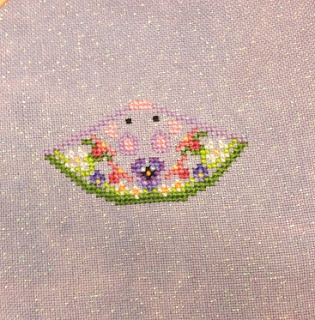 I finished backstitching and beads last night, and I will work on turning it into a mouse this weekend. I wasn't able to get the called-for linen, but I have a lavender opalescent linen in my stash (Under the Sea, "Khione") and I kinda love it for this. What surprises me most about this is how tiny it is. Just above an inch from top to bottom. The templates for the house sections are also really, really small. So cute! I'll start on the house today. I'm going to use another Under the Sea fabric for that - "Beachwalk," which is a beige with some 'greige' mottling. It's darker than the called-for fabric looks in the model pics, but I think it will be fine. It's funny how I really don't have much in the way of beige/tan/off-white/gray linen in my stash. I've accumulated a lot of colors, but only a couple of neutrals. 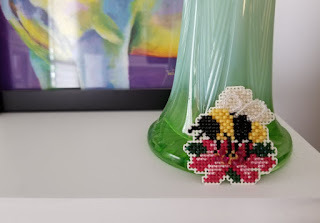 Is anyone else (in the northern hemisphere) having Spring fever? I have done a bunch of decluttering lately. We have 'big trash pick up' day in a couple of weeks, and I'm participating in a garage sale in May, and I'm being ruthless with things. My small spare room upstairs is piled with things for the garage sale. I'm getting rid of a whole bed, even. I emptied a standing cabinet in my kitchen by decluttering the butler's closet of small appliances and random home-improvement-y stuff. With that cabinet gone I now have juuuuuuust enough room for a kitchen table! Hurray! I'm hoping that I can truly minimize everything in my house, from clothes to furniture. I loathe housecleaning, and clutter makes it even harder to do, so I hope that if I can seriously pare things down I'll be able to keep up with cleaning. And then I'd have one less thing to feel overwhelmed by. Beautiful finish! It turned out perfect in my opinion though I don't blame you for being worried. Love your other finish. So funny. Your new start is too cute. I agree with you about the mouse skin rug haha. Too funny. We've done a lot of organizing here. Feels good to have it done. Hope you can find a better job closer to home. Good luck! Congratulations on the finished finish of A Little Gray Hare! It turned out super. In Every Nest is adorable as is your mouse. Look forward to seeing your other starts. Enjoy the rest of your weekend, Amy! WOW that is a long commute. I am blessed I am 15 minutes from my job. I am not Spring Cleaning per say, but I am in the mood for tossing stuff. I really think it is so much fun. 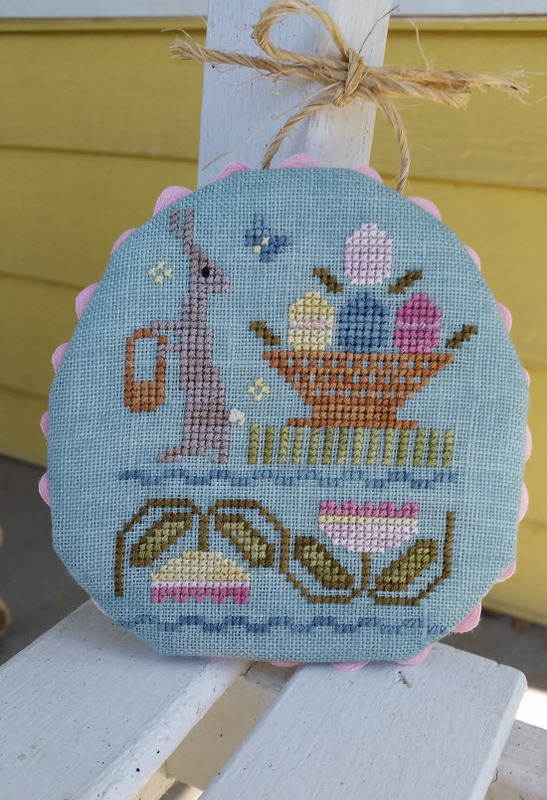 Your stitching is great - I love the birds in the nest. I love your FFO, it's just beautiful. You did a great job! 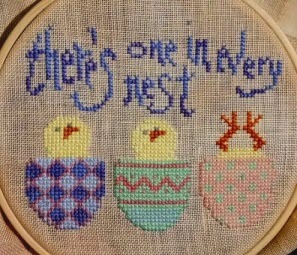 One in Every Nest is a really cute design too, love it. I love decluttering, I can't stand having too many possessions. Sadly my husband and sons are all hoarders so I live in a permanent state of stress! Sweet Easter stitches you've created.